ΕΑΜ poster reading: "everybody in arms"
The National Liberation Front (Greek: Εθνικό Απελευθερωτικό Μέτωπο, translit. Ethniko Apeleftherotiko Metopo), commonly known by its acronym EAM, was the main movement of the Greek Resistance during the Axis occupation of Greece. Its main driving force was the Communist Party of Greece (KKE), but its membership throughout the occupation included several other leftist and republican groups. ΕΑΜ became the first true mass social movement in modern Greek history. Its military wing, the Greek People's Liberation Army (ELAS), quickly grew into the largest armed guerrilla force in the country, and the only one with nation-wide presence. At the same time, from late 1943 onwards, the political enmity between ΕΑΜ and rival resistance groups from the centre and right evolved into a virtual civil war, while its relationship with the British and the British-backed Greek government in exile was characterized by mutual mistrust, leading EAM to establish its own government, the Political Committee of National Liberation, in the areas it had liberated in spring 1944. Tensions were resolved provisionally in the Lebanon Conference in May 1944, when EAM agreed to enter the Greek government in exile under Georgios Papandreou. The organisation reached its peak after liberation in late 1944, when it controlled most of the country, before suffering a catastrophic military defeat against the British and the government forces in the Dekemvriana clashes. This marked the beginning of its gradual decline, the disarmament of ELAS, and the open persecution of its members during the "White Terror", leading eventually to the outbreak of the Greek Civil War. 4 First Civil War and "Mountain Government"
During the Metaxas Regime, the Communist Party of Greece (KKE) was outlawed and its members persecuted. Its hierarchy and organisation suffered heavy blows from Metaxas' efficient security forces, and more than 2,000 Communists were imprisoned or sent to internal exile. With the German invasion and occupation of the country in April–May 1941, several hundred members were able to escape and flee to the underground. Their first task was to reform the Party, along with subsidiary groups like the "National Solidarity" (Εθνική Αλληλεγγύη, EA) welfare organization May 28. After the German attack on the Soviet Union on 22 June and the break of the Molotov–Ribbentrop Pact, the newly reconstituted Communist Party found itself firmly on the anti-Axis camp, a line confirmed by the Party's 6th Plenum during 1–3 July. The Communists were committed to a "Popular Front" tactic, and tried to engage other parties from the left and the centre, including established pre-war politicians. However, the efforts proved largely fruitless. On 16 July, however, the "National Workers' Liberation Front" (Εθνικό Εργατικό Απελευθερωτικό Μέτωπο, ΕΕΑΜ) was established, bringing the country's labour union organisations together. At the ΚΚΕ's 7th Plenum, the establishment of ΕΑΜ was decided despite the refusal of mainstream politicians to participate. ΕΑΜ was founded on 27 September 1941 by representatives of four left-wing parties: Lefteris Apostolou for the ΚΚΕ, Christos Chomenidis for the Socialist Party of Greece (SKE), Ilias Tsirimokos for the Union of People's Democracy (ELD) and Apostolos Vogiatzis for the Agricultural Party of Greece (ΑΚΕ). ΕΑΜ's charter called for the "liberation of the Nation from foreign yoke" and the "guaranteeing of the Greek people's sovereign right to determine its form of government". At the same time, while the door was left open to cooperation with other parties, the ΚΚΕ, with its large size in relation to its partners, assumed a clearly-dominant position within the new movement. Furthermore, the ΚΚΕ's well-organized structure and its experience with the conditions and necessities of underground struggle were crucial to ΕΑΜ's success. Georgios Siantos was appointed as the acting leader, since Nikolaos Zachariadis, the ΚΚΕ's proper leader, was interned in Dachau concentration camp. On 10 October, ΕΑΜ published its manifesto and announced itself and its aims to the Greek people. During the autumn of 1941, its influence expanded throughout Greece, either through pre-existing Communist cells or through the spontaneous actions of local "people's committees". Following Communist practice, ΕΑΜ took care to set up a refined system with which to engage and mobilize the mass of the people. 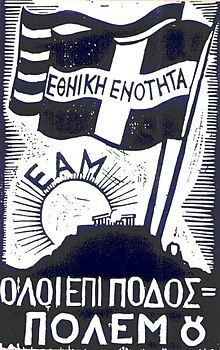 ΕΑΜ committees were thus established on a territorial and occupational basis, starting from the local (village or neighbourhood) level and moving up, and subsidiary organizations were created: a youth movement, the "United Panhellenic Organisation of Youth" (EPON), a trade union, the "Workers' National Liberation Front" (ΕΕΑΜ), and a social welfare organization, "National Solidarity" (EA). ΕΑΜ's military wing, the "Greek People's Liberation Army" (ELAS) was formed in December 1942, and a crude navy, the "Greek People's Liberation Navy" (ELAN), was established later, but its strength and role were severely limited. First Civil War and "Mountain Government"
One of the great successes of ΕΑΜ was the mobilization against the plans of the Germans and the collaborationist government to send Greeks into forced labour in Germany. Public knowledge of the plans created "a kind of pre-insurrectional atmosphere", which in February 1943 led to a mounting series of strikes in Athens, culminating in an ΕΑΜ-organized demonstration on 5 March, which forced the collaborationist government to back down. In the event, only 16,000 Greeks went to Germany, representing 0.3% of the foreign labour force total. ELAS fought against German, Italian and Bulgarian occupation forces as well as, by late 1943, anticommunist rival organizations, the National Republican Greek League (EDES) and the National and Social Liberation (EKKA). It succeedied in destroying the latter entirely in April 1944. ΕΑΜ-ELAS activity resulted in the complete liberation of a large area of the mountainous Greek mainland from Axis control, where in March 1944, ΕΑΜ established a separate government, the "Political Committee of National Liberation" (PEEA). ΕΑΜ even carried out elections to the PEEA's parliament, the "National Council", in April; for the first time in Greek electoral history, women were allowed to vote. In the elections, it is estimated that 1,000,000 people voted. In the territories that it controlled, ΕΑΜ implemented its own political concept, known as laokratia (λαοκρατία, "people's rule"), based upon "self-administration, involvement of new categories (mainly women and youths) and popular courts". At the same time, the mechanisms of the "revolutionary order" created by ΕΑΜ were often employed to eliminate political opponents. The position of EAM/ELAS in occupied Greece was unique in several aspects: whereas the other two main resistance groups, the National Republican Greek League (EDES) and National and Social Liberation (EKKA), as well as the various minor groupings, were regionally active and mostly military organizations centred on the persons of their leaders, EAM was a true nation-wide mass political movement that tried to "enlist the support of all sections of the population". Although precise numbers do not exist, out of a total Greek population of 7.5 million, at its height in late 1944 EAM numbered, from a low estimate of 500,000–750,000 (according to Anthony Eden) up to some 2,000,000 (according to EAM itself) members in its various affiliated organizations, including 50,000–85,000 men in ELAS. Although the poorer sections of society were naturally well represented, the movement included many of the pre-war elites as well: no fewer than 16 generals and over 1,500 officers of the army, thirty professors of the University of Athens and other institutions of higher education, as well as six bishops of the Church of Greece and many ordinary priests. After Liberation in October 1944, the tensions between ΕΑΜ and anticommunist forces, which were supported by Britain, escalated. Originally, as agreed at the Lebanon conference, ΕΑΜ participated in the government of national unity under George Papandreou with 6 ministers. Disagreements regarding the disarmament of ELAS and the formation of a national army made their ministers, on 1 December, resign. ΕΑΜ organized a demonstration in Athens on December 3, 1944 against British interference. The exact details of what happened have been debated ever since, but gendarmes opened fire on the crowd, resulting in 25 dead protesters (including a six-year-old boy) and 148 wounded. The clash escalated into a month-long conflict between ELAS and the British and Greek governmental forces, known as the "December events" (Dekemvrianá), which resulted in a government victory. In February, the Varkiza agreement was signed, leading to the disbandment of ELAS. In April, the SKE and ELD parties left ΕΑΜ. ΕΑΜ was not dissolved but was now for all intents and purposes merely an expression of the ΚΚΕ. During the 1945-1946 period, a conservative terror campaign (the "White Terror") was launched against ΕΑΜ-ΚΚΕ supporters. The country became polarized, eventually leading to the outbreak of the Greek Civil War in March 1946, which lasted until 1949. In its aftermath, and in the context of the Cold War, ΚΚΕ was outlawed, and ΕΑΜ/ELAS vilified as an attempt at "communist takeover" and accused of various crimes against political rivals. The issue remains a highly controversial subject. With the coming of the socialist Andreas Papandreou to power in 1981, however, ΕΑΜ was recognized as a resistance movement and organization (as were already recognized other resistance organizations by the previous conservative governments) and the fighters of ELAS were honoured and given state pensions. ^ a b Mazower 1993, p. 103. ^ Mazower 1993, pp. 108–109. ^ Wievorka & Tebinka 2006, p. 165. ^ Wievorka & Tebinka 2006, p. 158. ^ Wievorka & Tebinka 2006, p. 169. ^ Wievorka & Tebinka 2006, p. 170. ^ Stavrianos 1952, pp. 41–42. ^ Stavrianos 1952, p. 44. ^ Stavrianos 1952, pp. 44–45. Eudes, Dominique (1973). The Kapetanios: Partisans and Civil War in Greece, 1943-1949. Translated by John Howe. New York and London: Monthly Review Press. ISBN 978-0-85345-275-1. Grigoriadis, Solon (1982). Συνοπτική Ιστορία της Εθνικής Αντίστασης, 1941-1944 [Concise History of the National Resistance, 1941-1944] (in Greek). Athens: Kapopoulos. Hellenic Army History Directorate (1998). Αρχεία Εθνικής Αντίστασης, 1941-1944. Τόμος 3ος "Αντάρτικη Οργάνωση ΕΛΑΣ" [National Resistance Archives, 1941-1944. 3rd Volume "ELAS Partisan Organization"]. Athens: Hellenic Army History Directorate. ISBN 960-7897-31-5. Hellenic Army History Directorate (1998). Αρχεία Εθνικής Αντίστασης, 1941-1944. Τόμος 4ος "Αντάρτικη Οργάνωση ΕΛΑΣ" [National Resistance Archives, 1941-1944. 4th Volume "ELAS Partisan Organization"]. Athens: Hellenic Army History Directorate. ISBN 960-7897-32-3. Mazower, Mark (1993). Inside Hitler's Greece: The Experience of Occupation, 1941–44. New Haven and London: Yale University Press. ISBN 0-300-06552-3. Sarafis, Stefanos (1951). Greek Resistance Army: The Story of ELAS. London: Birch Books. OCLC 993128877. Stavrianos, L. S. (1952). "The Greek National Liberation Front (EAM): A Study in Resistance Organization and Administration". The Journal of Modern History. 24 (1): 42–55. JSTOR 1871980. Vafeiadis, Markos (1985a). Απομνημονεύματα, Β' Τόμος (1940-1944) [Memoirs, Volume II (1940-1944)] (in Greek). Athens: A. A. Livanis. Vafeiadis, Markos (1985b). Απομνημονεύματα, Γ' Τόμος (1944-1946) [Memoirs, Volume III (1944-1946)] (in Greek). Athens: A. A. Livanis. Wievorka, Olivier; Tebinka, Jacek (2006). "Resisters: From Everyday Life to Counter-state". In Gildea, Robert; Wievorka, Olivier; Warring, Anette (eds.). Surviving Hitler and Mussolini: Daily Life in Occupied Europe. Oxford: Berg. pp. 153–176. ISBN 978-1-84520-181-4. This page was last edited on 14 April 2019, at 10:00 (UTC).